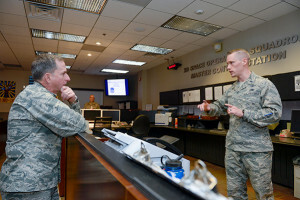 Gen. David L. Goldfein, Chief of Staff of the Air Force, listens to 1st Lt. Mark Skinner, 2nd Space Operations Squadron GPS mission commander, explain current 2 SOPS activities during his visit at Schriever Air Force Base, Colorado, Tuesday, Dec. 20, 2016. Goldfein toured various squadrons across the base during his visit, receiving in-person briefings and engaging with Airmen. 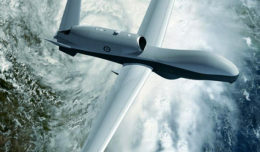 Three of six new Lockheed Martin developed, state-of-the-art receivers are now deployed to help the U.S. Air Force maintain the accuracy of Global Positioning System (GPS) satellite signals. In June, the first new Monitor Station Technology Improvement Capability (MSTIC) receiver became operational at Cape Canaveral Air Force Station, Fla. The upgrades continued at Air Force Monitoring Stations on the Kwajalein Atoll and Hawaii. These critical upgrades of the GPS Monitoring Stations from early 1990s technology are part of an overall effort to modernize and maintain the current GPS ground control system, known as the Architecture Evolution Plan Operational Control Segment. GPS Monitoring stations are globally-dispersed, fixed-position sites that monitor GPS satellite signals and help maintain their navigation and positioning accuracy for users around the world. 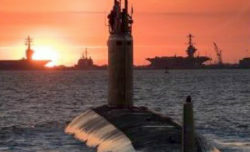 Under Lockheed Martin’s GPS Control Segment (GCS) Sustainment contract, the company utilized an agile development methodology to develop and deploy the first MSTIC receiver on schedule in under 36 months. The three remaining Air Force GPS Monitoring Stations will be upgraded with MSTIC receivers by the end of 2017. “MSTIC’s new SDR technology enables the remote application of mission specific software updates which will improve performance and enable reception of modernized GPS signals,” adds Sica. 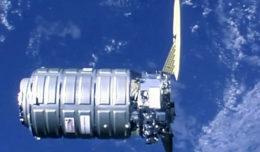 The Global Positioning Systems Directorate at the U.S. Air Force Space and Missiles Systems Center contracted the MSTIC upgrade. Air Force Space Command’s 2nd Space Operations Squadron (2SOPS), based at Schriever Air Force Base, Colorado, manages and operates the GPS constellation for both civil and military users.